Back in Nov 2004 in Mumbai, in the 4th test, India 104 & 205 beat Australia 203 & 93 by 13 runs, which is the lowest margin for India. Micheal Clarke had magical figures of 6.2-0-9-6 in Indian second innings – yet, the commentator Murali Kartik with 7 wickets in the match was the man of the match. The lowest in the history of Test Cricket is that of 4th test at Adelaide in Jan 1993 when WI beat Aussies. WI 252 & 146 beat Australia 213 & 184. Curtly ambrose was the Man of the match. Today at Abu dhabi, it was a miracle – dead and buried against Pakistan, New Zealand fought valiantly to summon one of the greatest comebacks in their test cricket history, turning the test on its head to claim a famous four-run triumph. It was a game that they had absolutely no right to win. Chasing 176, Pakistan were cruising at 130-3, with Asad Shafiq and Azhar Ali having added 82 to put their side on the cusp of victory. Even when Neil Wagner removed Shafiq just before lunch, it seemed a mere footnote in the plotline seemingly scripted for this tour – the Black Caps being good, but not quite good enough. The equation had been reduced to just 29 runs required with six wickets in hand, and with experienced batsmen at the crease, it looked like the question was not if, but when, Pakistan would take a 1-0 series lead. In the pantheon of infamous Pakistan implosions, this must rank right around the top. Pakistan were cantering to a victory around lunchtime, courtesy Asad Shafiq and Azhar Ali, and the wicket of Shafiq off the last ball before lunch seemed no more than an inconsequential irritant. But New Zealand, blindly, illogically, unreasonably, refused to write off this match as a lost cause, compelling Pakistan to believe the game was still on, the pressure all theirs to bear. Kiwis had a four-run victory, their narrowest Test win in history, and surely one of their most gratifying ones. The score card reads : New Zealand 153 (Williamson 63, Yasir 3-54) and 249 (Watling 59, Nicholls 55, Hasan 5-45, Yasir 5-110) beat Pakistan 227 (Babar 62, Boult 4-54) and 171 (Azhar 65, Patel 5-59) by four runs. Black Caps captain Kane Williamson hailed the performance as a superb fighting effort. "It's a great advertisement for test cricket. We knew the surface wasn't easy and it required a really scrappy performance. The attitude was outstanding – the guys stayed in the contest for long periods of time. "That fighting attitude that we showed throughout was something that we want to hold onto." It was an attitude which led to the Black Caps conquering with the second-lowest fourth-innings target they have ever successfully defended. The lowest was 137 in the famous win over England in Wellington in 1978. The third-lowest is now the 241 defended in beating Australia in Hobart in 2011, another memorable victory. 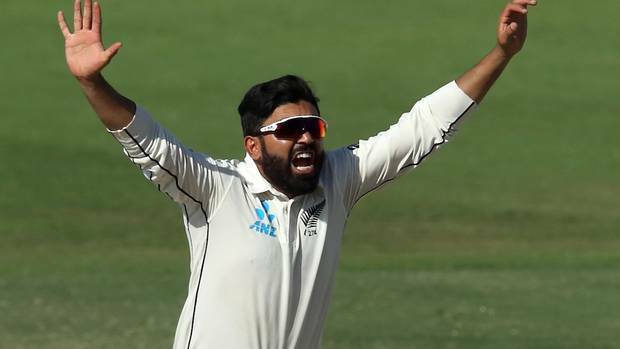 The debutant Ajaz Patel hailing from India had figures of 5/59 - the second best by a New Zealand spinner on Test debut. Alex Moir had taken 6 for 155 against England in Christchurch in 1951, which is the best. Ajaz was also named Man of the Match, which makes him fifth New Zealand player to win the award on Test debut.